00:35:00 Makes 6 servings, 1-1/2 cups each. Makes 6 servings, 1-1/2 cups each. Looking for a quick skillet dish they're sure to love? 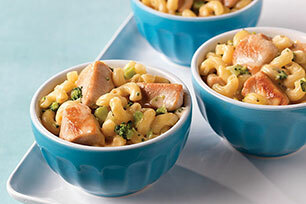 Try this one-pan cheesy pasta with tender chicken chunks and broccoli florets. Heat oil in large nonstick skillet on medium-high heat. Add chicken; cook 5 to 7 min. or until chicken is cooked through, stirring occasionally. Stir in broth and water. Bring to boil. Stir in macaroni; cover. Reduce heat to medium-low. Simmer 8 to 10 min. or until macaroni is tender. Add Velveeta and broccoli. Cook 5 min. or until Velveeta is completely melted and broccoli is heated through, stirring frequently. Try serving with whole wheat rolls and a side salad tossed with your favourite Kraft Dressing. To quick-thaw frozen vegetables, place them in a colander and run hot water over them until thawed. Drain well. This tasty one pot meal is not only an excellent source of vitamins A and C thanks to the broccoli, it is also an excellent source of calcium. Serving Size Makes 6 servings, 1-1/2 cups each.